Today, plastic tanks are manufactured to include corrugations and structural ribbing to strengthen the tank, as well as interior structural bulkheads. Injection molding has enabled the manufacture of large plastic tanks of more than 1,500 gal, which are a main component in commercial and community wastewater systems and potable water applications. These new injection-molded tanks are an advancement over plastic tanks. Some are available in easy-to-ship, two-piece designs and include continuous gaskets and a fixed, permanent connector system for a watertight seal. Plastic tanks also can be manufactured by the rotational molding process. These typically are a one-piece design minimizing leak potential. Tanks for decentralized wastewater treatment are a big part of the story; however pump tanks, rainwater harvesting tanks for non-potable and potable use, storm water runoff storage tanks, and agricultural and chemical storage tanks also are evolving to accommodate new regulations and applications. 1. Advanced Onsite Wastewater Treatment Systems. Advanced Onsite Wastewater Treatment Systems (AOWTS) such as membrane bioreactors installed inside a tank provide treatment, minimize site disruption, and are portable for remote system applications. These compact systems depend on the tank’s integrity as a treatment vessel to protect the system components. 2. Shallow Low-profile Systems. On difficult sites with rock, problematic soils, or a high-water table, the desirability of installing a tank in a shallow low-profile configuration to leverage the available space has pushed designers to be creative and evaluate the use of new tank technologies. 3. Rainwater Harvesting. Rainwater harvesting for non-potable and potable use is gaining popularity in tank design. Plastic tanks excel in whole-house potable water systems that collect rainwater from the roof and treat it to potable drinking standards. With tank advances and updated potable water collection system designs, homeowners have options in areas where groundwater is scarce and rain is prevalent. Proper excavation and bedding procedures are essential for a quality tank installation. Regardless of the tank material (concrete, plastic or fiberglass), appropriate measures should be taken to ensure that the excavation is properly prepared and leveled prior to setting the tank, and that suitable backfill is available per the specification outlined in the tank manufacturer’s installation instructions. When excavating for a tank installation, over-digging the base should be avoided to reduce the chance of uneven settling or the need for excessive bedding material. The length and width of the excavation should provide adequate space to allow for proper compaction of the suitable backfill and a safe working environment for the installation crew. Furthermore, the inlet, outlet and delivery lines need to be properly bedded to minimize settling. Depending on the site and the applications, once the tanks are properly backfilled and compacted per the manufacturer’s installation instructions, topsoil should be placed up to the final grade and sloped to provide positive drainage away from the system. To minimize erosion and divert surface water, the site should be planted with vegetation. Giant Goose Ranch is a reclaimed strip mine property in Fulton County, Ill., covering more than 800 acres with more than 50 small lakes famous for fishing. Plans to rehab an existing campground to add resort cabins, 90 campsites and a banquet facility required a new wastewater treatment system. The inconsistent soils, lakes, elevation changes and stringent code requirements challenged System Designer Ray Tebo of New Excavating Technology. The water recycling membrane systems designed include Bio-Microbics BioBarrier Membrane (MBR) systems installed within Infiltrator IM-Series Tanks. The numerous MBRs are either 500 or 1,000 gal per day (gpd) units built to suit the location. Single units serve individual cabins and 1,000 gpd MBRs serve clusters of resort cabins, beach houses, a store and the banquet hall. The first phase of the project included 17 separate systems. The two-piece plastic tanks allowed offsite assembly of the units and delivery and installation without a heavy boom truck resulting in cost savings. Wastewater flows from the campsites to a 1,000-gal septic tank, which provides primary treatment. From there, the wastewater flows by gravity to a 1,500 gal IM-Series tank that houses two 500-gpd MBRs. This recycled wastewater is time dosed to the engineered geosynthetic aggregate dispersal fields. Lift stations were installed to send wastewater to the dispersal fields and to the trash tanks due to site elevation variations. The 540 gal tanks were specified for the pump tanks, each of which include either a standard pump for recycled water from one of the MBRs or a trash grinder pump for wastewater. A blower outside the tanks blows air to scour the membrane clean, which keeps the biomass alive and growing. A 1.5-amp marine pump attached to each MBR slowly pulls the recycled water out and then transitions to gravity flow to the dispersal fields. After drilling 605 ft and finding no water, the builder of a new 4,800-sq ft home near Raleigh, N.C. designed to achieve LEED Platinum Certification needed a solution. The total roof surface area of 11,000 sq ft available from the home and garage structures was calculated to yield 6,860 gal from a 1-in. rain event, which would provide ample water supply for the homeowner’s needs. 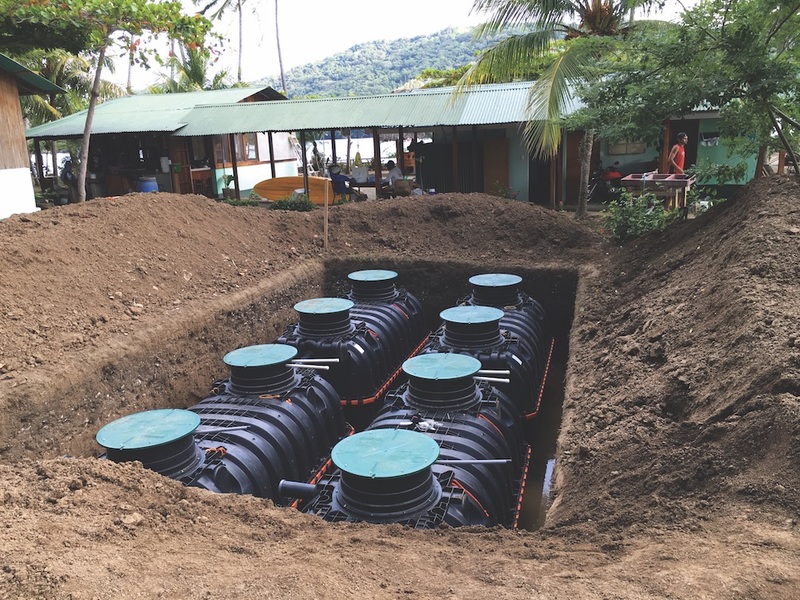 The potable water system is designed with four Infiltrator IM-1760C, 1,787-gal potable water tanks installed in series and connected at the bottom to function as one large tank and to yield a total storage volume of more than 7,000 gal. The Infiltrator tanks are certified to NSF/ANSI Standard 61 for potable water storage, meeting a rigorous set of national standards to ensure potable water storage safety. Rainwater is collected from the roofs via leaders and piping and directs it to a series of storage tanks. The water is piped from the buildings in Schedule 40 PVC pipe and then through a filter that allows nothing larger than 350 µ to enter the tanks. The first flush typically includes higher levels of contaminants, so prior to entering the tanks, the first 120 gal of water is diverted away from the tanks into a pipe, which discharges to a separate location. Once the pipe is filled, a valve closes and the remaining flow from the rain event enters the storage tanks. The first flush outlet is designed to slowly drain itself before the next rainfall. The tanks are buried outside the home and a submersible pump in the last tank in the series supplies water into the home. Prior to consumption, the water is pumped out of the tank and is treated via a set of three filters in an assembly; the first is a 20-µ filter, then a 5-µ filter, and finally a 1-µ carbon filter. Following the filtration process, the water is disinfected with an ultraviolet disinfection system. Opportunities Advances in tank manufacturing and improvements in recycling technology in the case of plastic tanks has increased the opportunity for larger-capacity tank systems. These advances have provided tanks that can meet stringent watertight standards and offer more versatile installation opportunities across applications. Dennis F. Hallahan, P.E., is technical director for Infiltrator Technologies. Hallahan can be reached at [email protected].